By Sean Barron | February 17, 2018 at 12:01a.m. If you’re seeking a few practical ideas regarding prudent money handling, but have no intention of consulting with a financial planner, you might do well to seek Asia Stubbs’ advice. “You get more things by saving, and I plan to continue to save,” the Taft Elementary School fifth-grader explained. Asia would know: She’s amassed about 25 Ybucks in savings and may use the school currency to buy an item or two, though her main priority is on growing her savings account and having it accrue interest. Asia outlined a few of her salient financial goals during an event this week at the South Side school, 730 E. Avondale Ave., in which she and several students and adults talked about the incentive program. Ybucks are bills awarded to students who exhibit positive behavior in the classroom, help others, display good character traits and have solid daily attendance, Principal Rick Gurski said. The “money” can be placed in checking or savings accounts set up at the school, which earn 3 percent and 10 percent interest, respectively. Ybucks also can be used to buy stuffed animals, games, crayons and a host of other merchandise from a “store” that operates like Amazon, with orders placed and delivered to classrooms weekly, Gurski explained, adding the effort will continue for the duration of the school year. The number of Ybucks needed to purchase items varies widely. For example, a granola bar requires five Ybucks, whereas 500 are needed to buy a remote-controlled helicopter. Saving Ybucks has allowed Danielle Dirando to purchase a scarf, a box of chewy candy and a snack item. Not lost on the fifth-grader, however, is the deeper underlying meaning of the fun-filled project. “I have to be on my best behavior. I have to be a good student, and I need to help new students,” she said. Issac Skaggs, a third-grader in Nancy Rocco’s class, said he plans to use his savings to buy a set of headphones. More importantly, though, the program has helped him better appreciate and differentiate between needs and wants – items that are or aren’t essential to one’s well-being, Issac added. 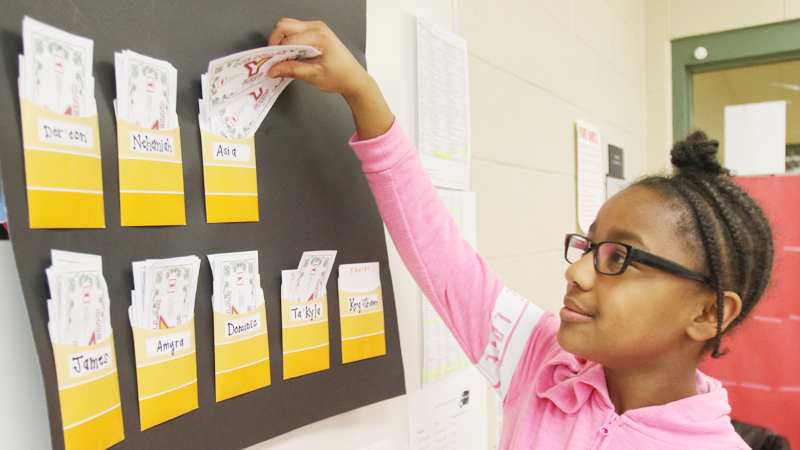 Rocco, an intervention specialist, added she has incorporated the program into her social-studies lessons to teach students about the importance of fiscal responsibility as well as the relationship between goods and services. Assisting Rocco keep track of the merchandise orders is Bobby Brown, a teacher’s aide. Alexis Xenakis, a special-education instructor for grades one through five, said her classroom also is being used as a “bank,” where the students keep their accounts that are accessible via computer. In addition, a teacher selects a Student of the Week. That youngster is given an opportunity to spend one minute in a money booth to collect then deposit as many Ybucks as possible, Gurski said. Last week’s Student of the Week was Kristal Erwin, a fourth-grader in Rocco’s class. Kristal was chosen because of her willingness to help a fellow student and other positive choices she made, Rocco said. February 16, 2018 10:55 p.m.
May 28, 2011 12:05 a.m.